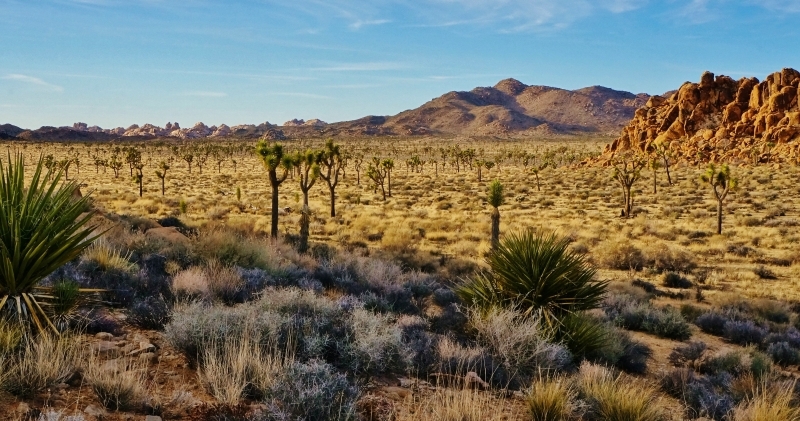 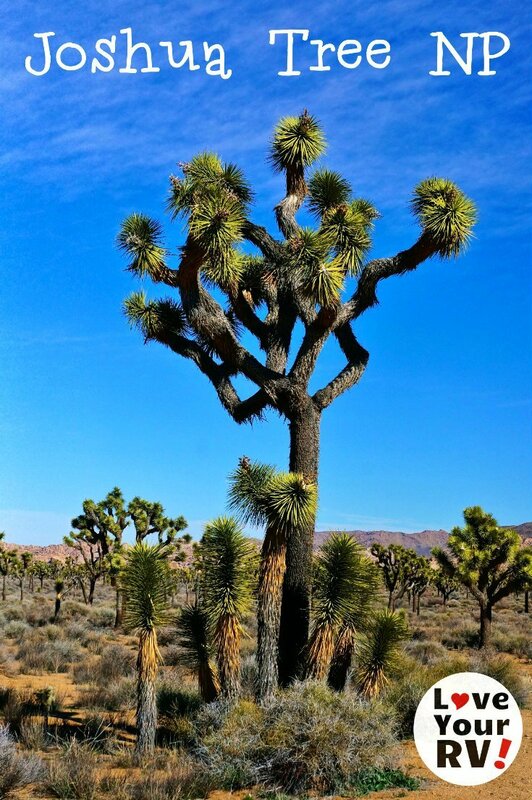 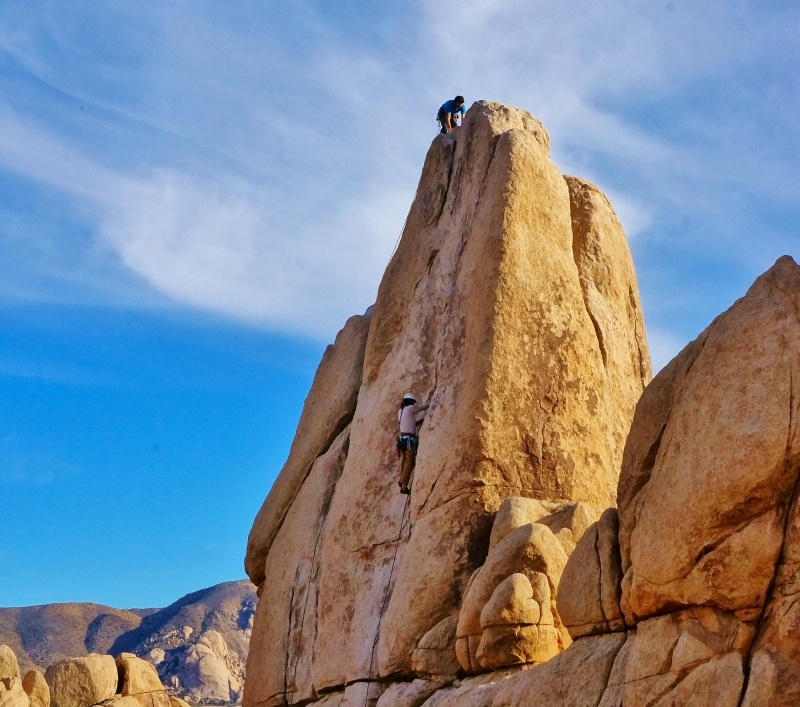 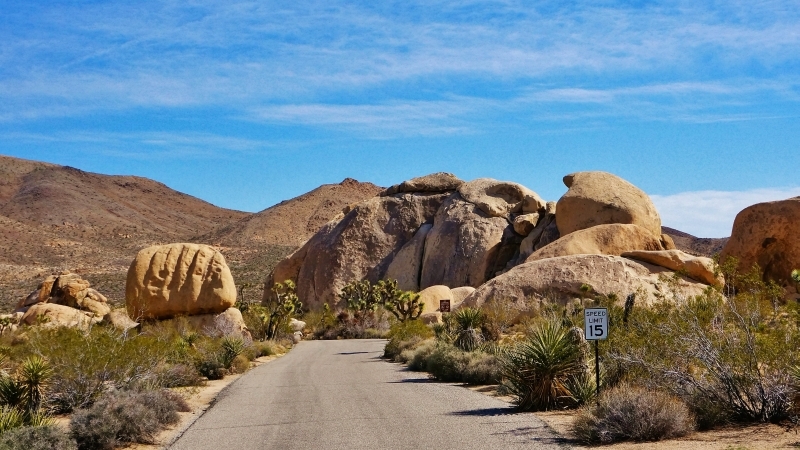 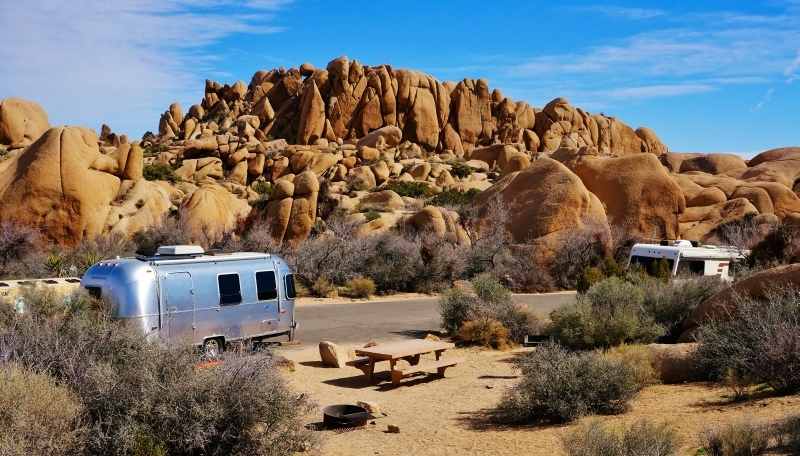 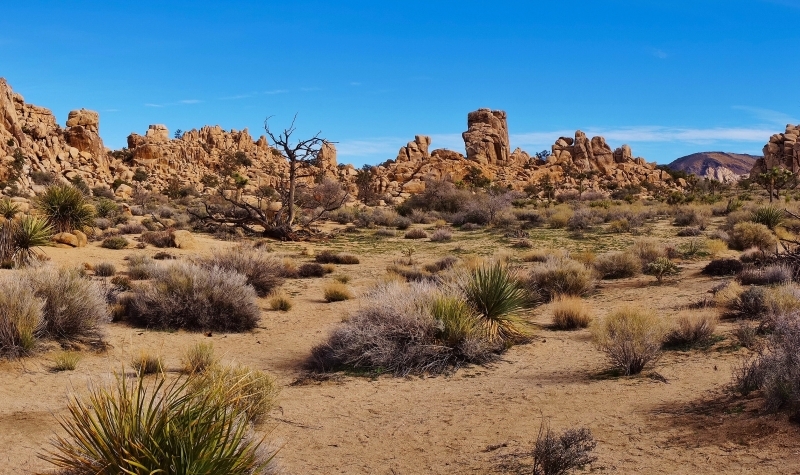 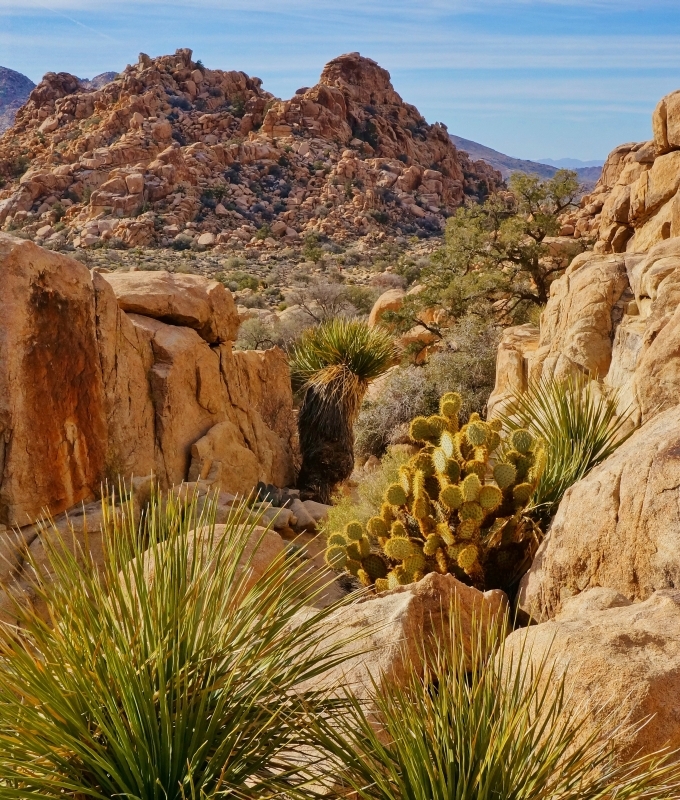 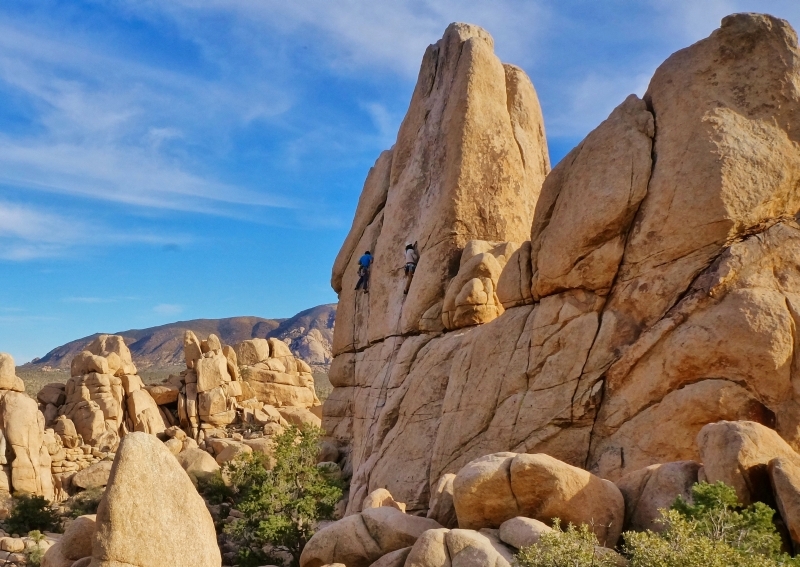 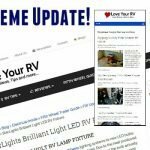 What can I say we absolutely love spending time in Joshua Tree National Park! 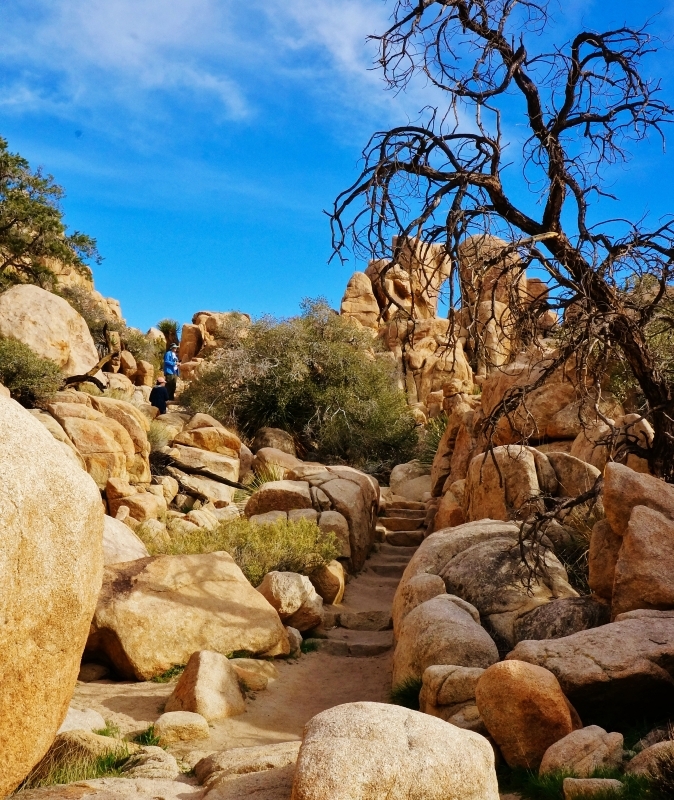 It is an amazing place for both our favorite hobbies hiking and photography. 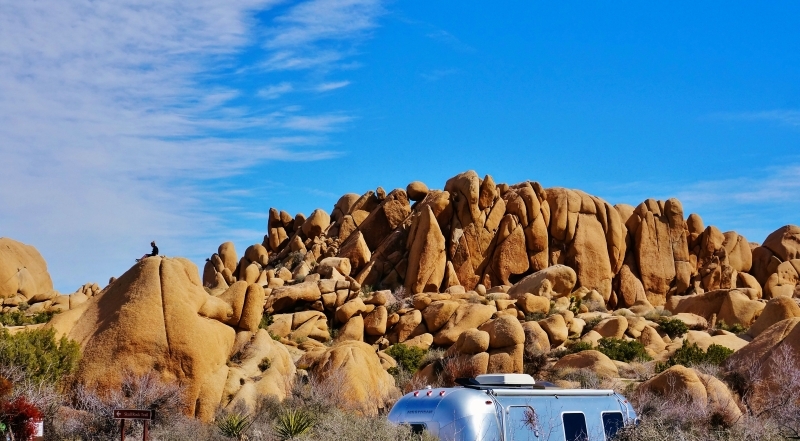 Home to some of the most scenic campsites you can imagine. 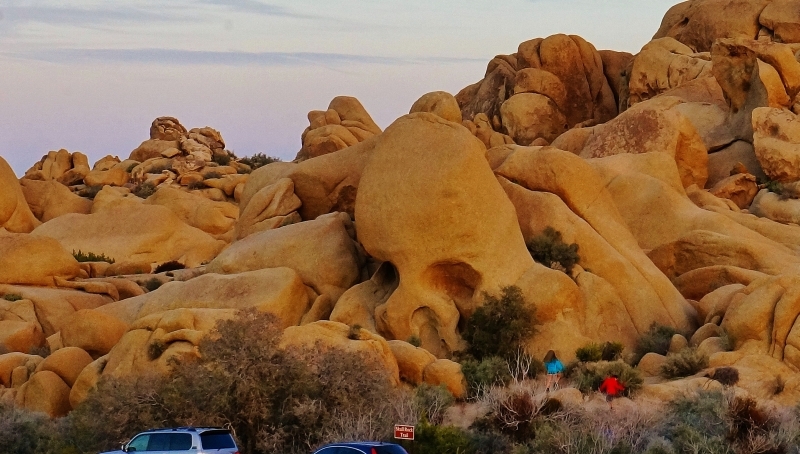 This was our third visit in four years and I think the best so far. 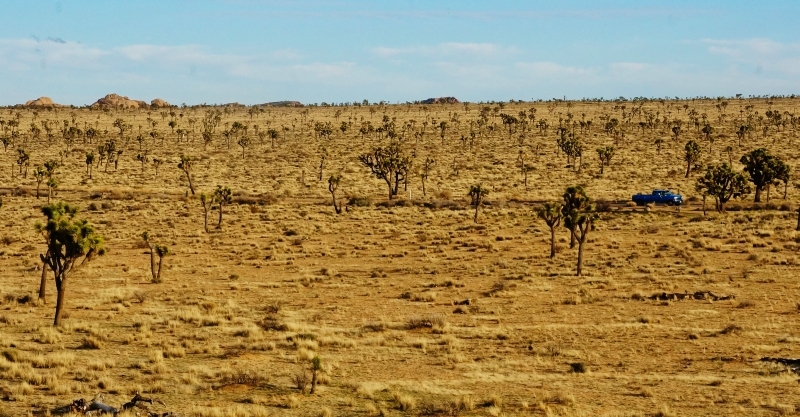 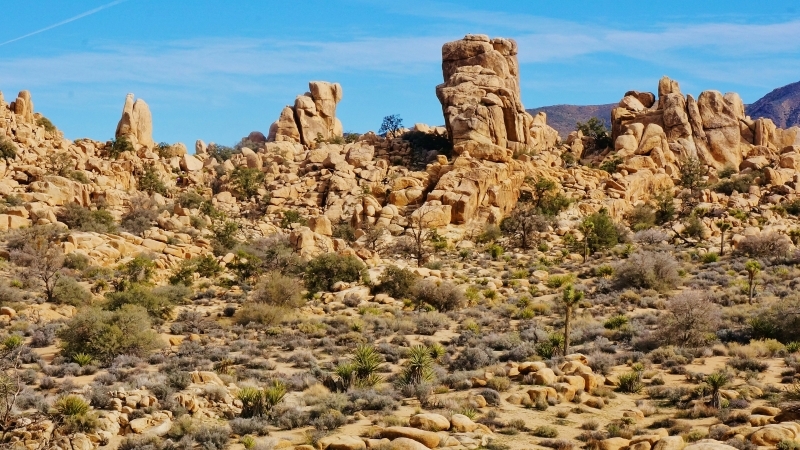 (See blog posts from our previous JTNP visits) We now really know our way around the park and the weather was spectacular, with highs in the 70’s and even 80’s, warmer than usually for mid-February. 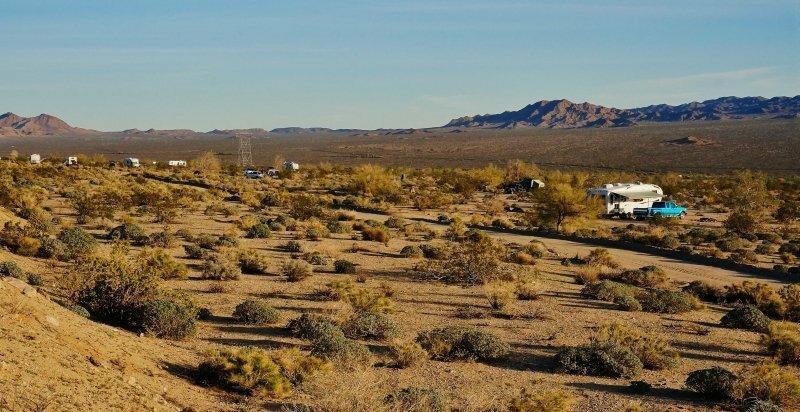 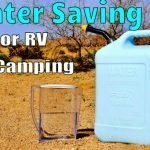 We spent the first few days camped just outside the park’s south entrance on some free BLM land. 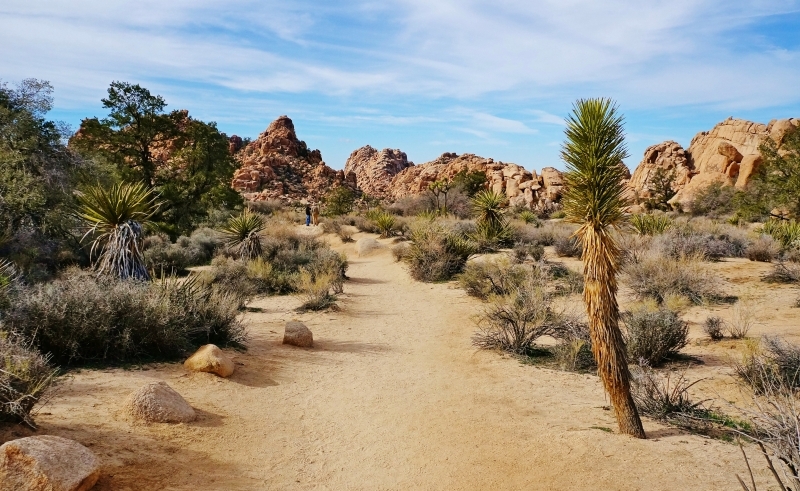 Unfortunately, I hadn’t clued into the fact that it was the Presidents Day long weekend plus the park was offering free admission. 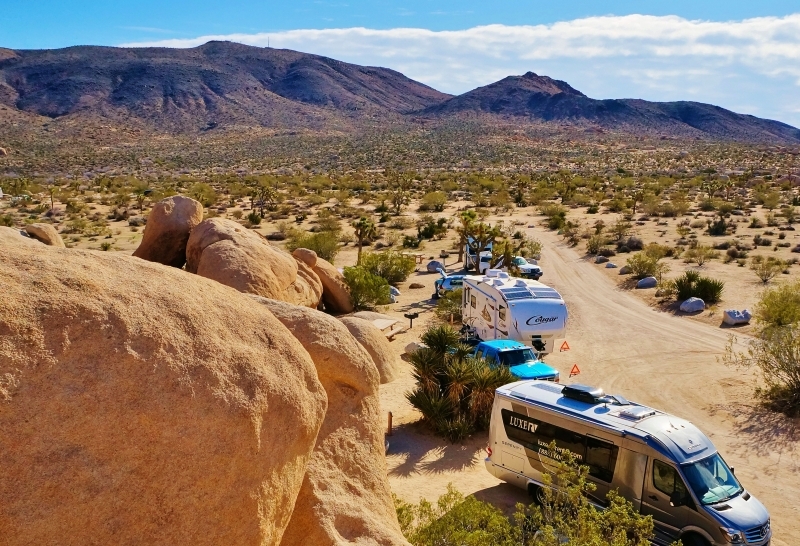 Every campsite inside was chock full. 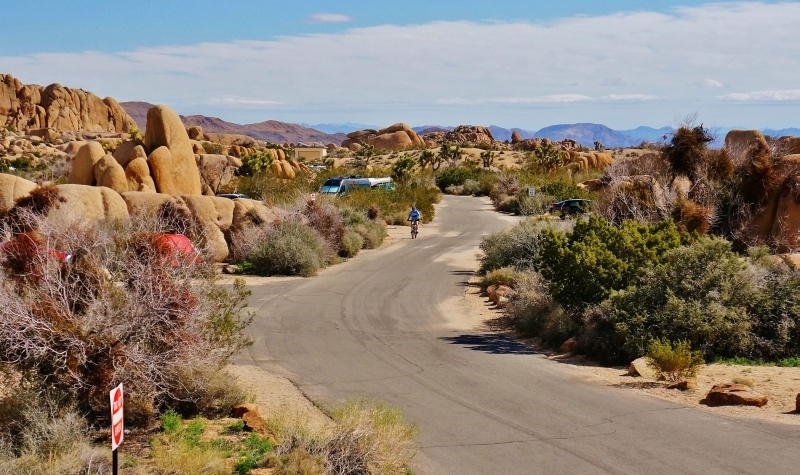 So, we hung out and waited out the crowds and on the holiday Monday headed in as most everyone else was headed out. 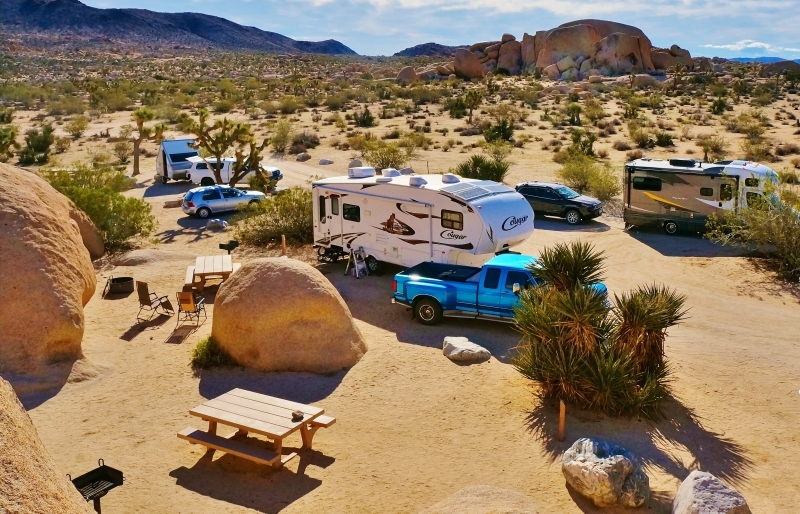 This was a good plan as we were able to snag one of the only spots large enough for our 28’ fifth wheel in one of my favorite campgrounds called Belle. 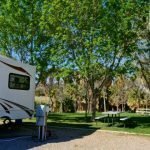 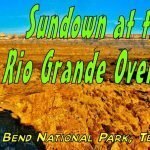 It’s close driving distance to the popular exhibits and hikes but small at 18 campsites and away from the main traffic areas, so very peaceful. 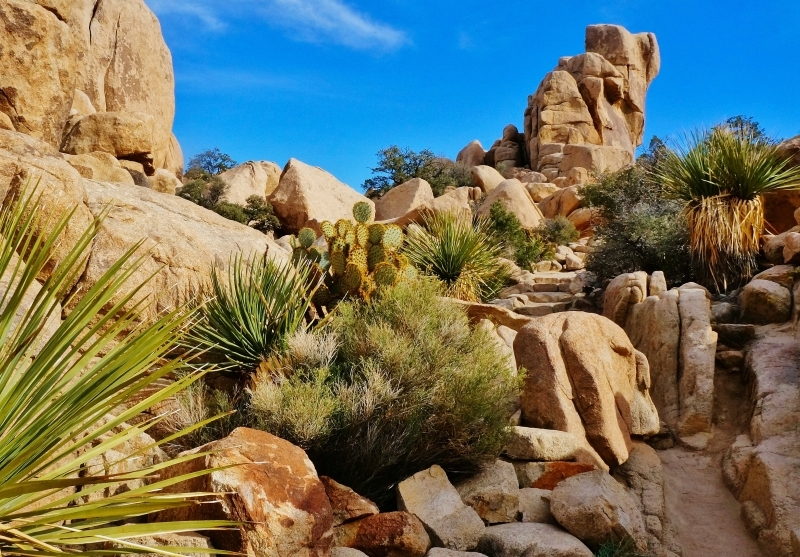 The next 4 days were spent revisiting our favorite attractions and exploring new ones, hiking, rock scrambling, relaxing in the campground and loading up our camera memory cards. 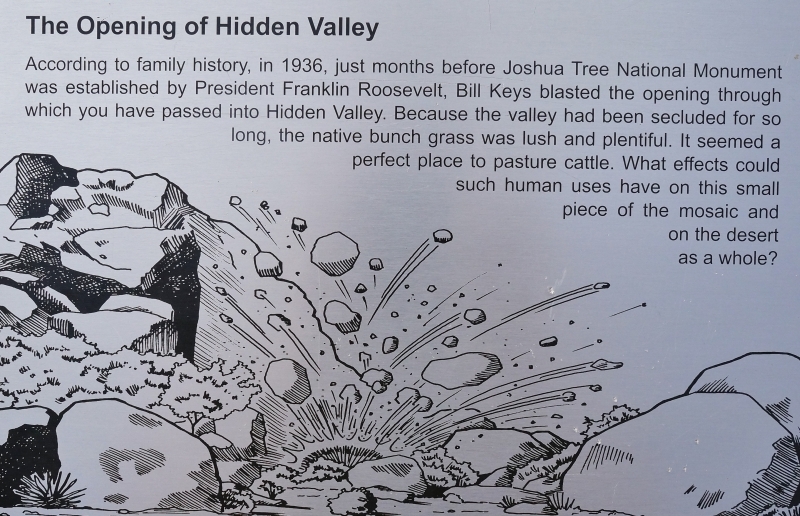 On the last afternoon, we decided to head back and revisit one of the coolest locations in the park, the Hidden Valley. 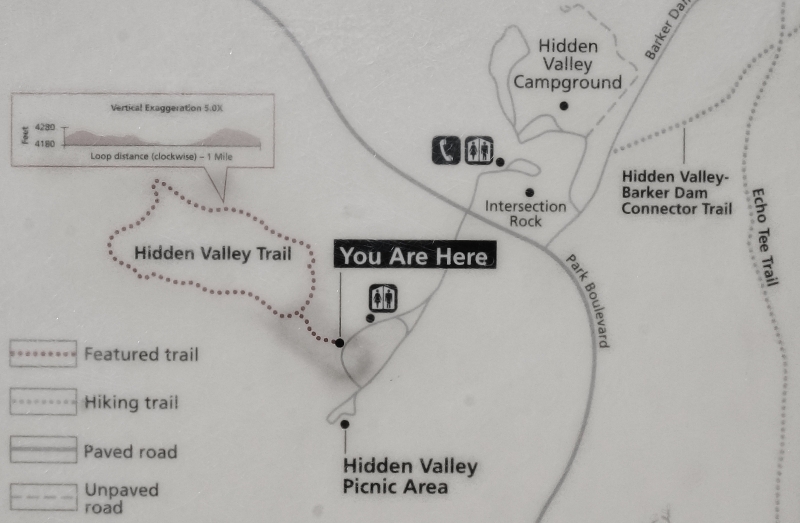 The Hidden Valley nature trail is only a mile or so long but you can spend hours on it exploring every nook and cranny of its gorgeous landscape. 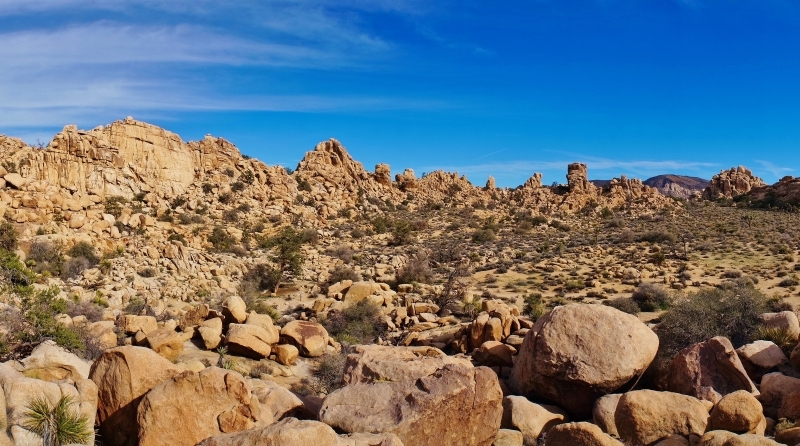 The valley is hidden because it’s surrounded by mounds of huge granite boulders and rock outcroppings. 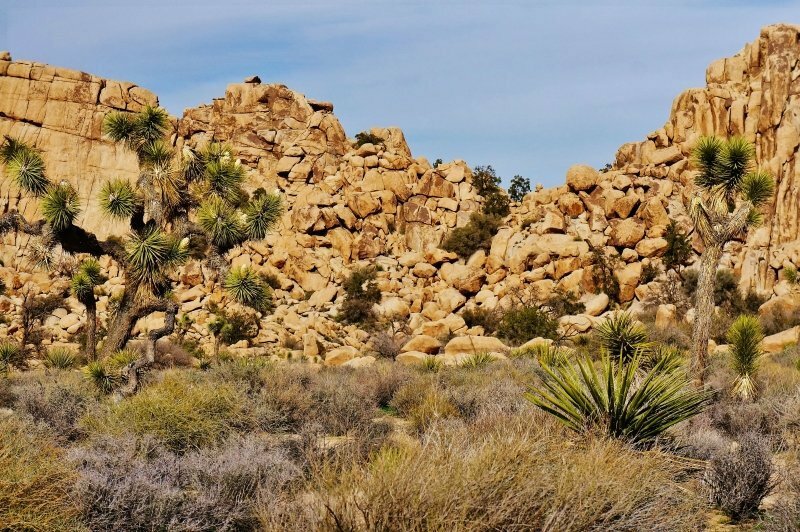 Inside the piled up rock walls is a unique ecosystem with its own microclimates giving the area very diverse range of plants and animals. 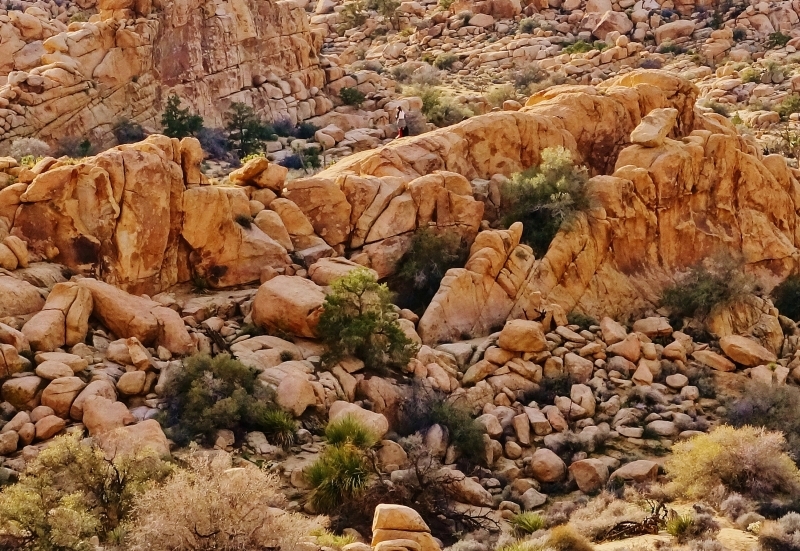 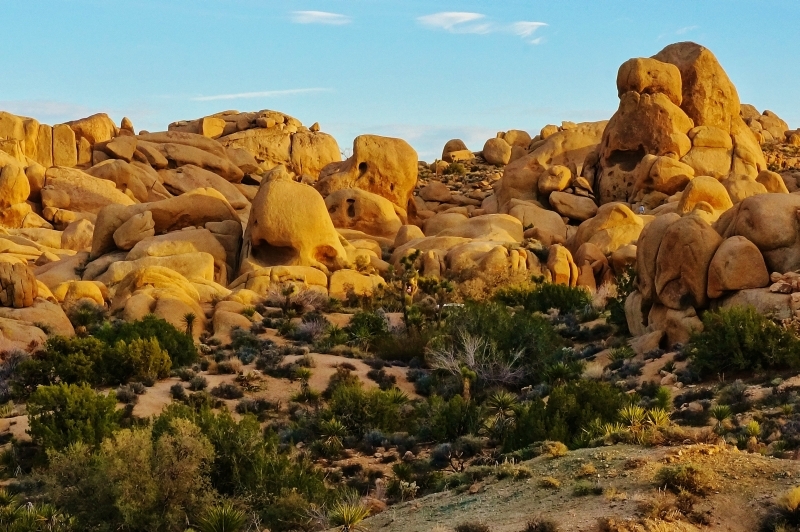 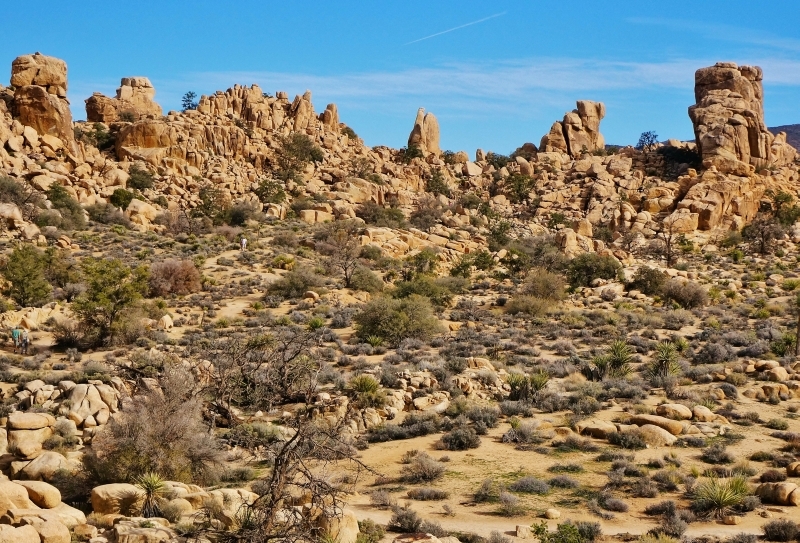 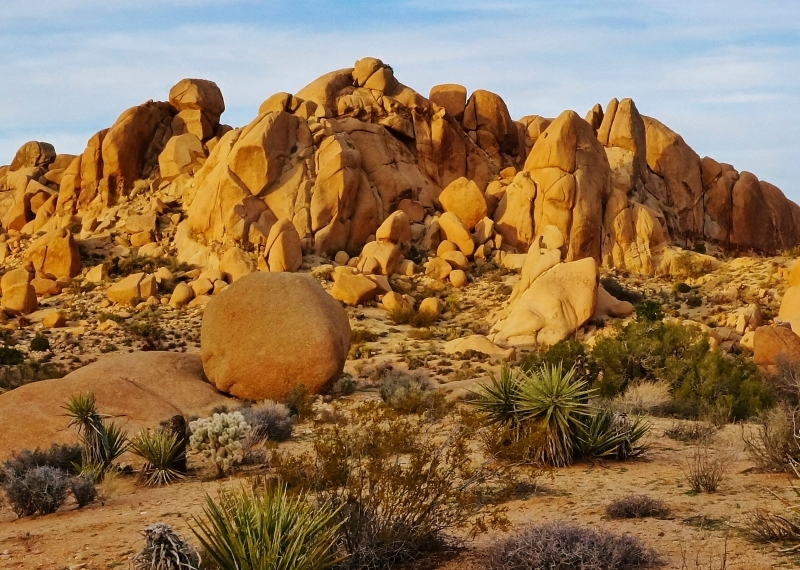 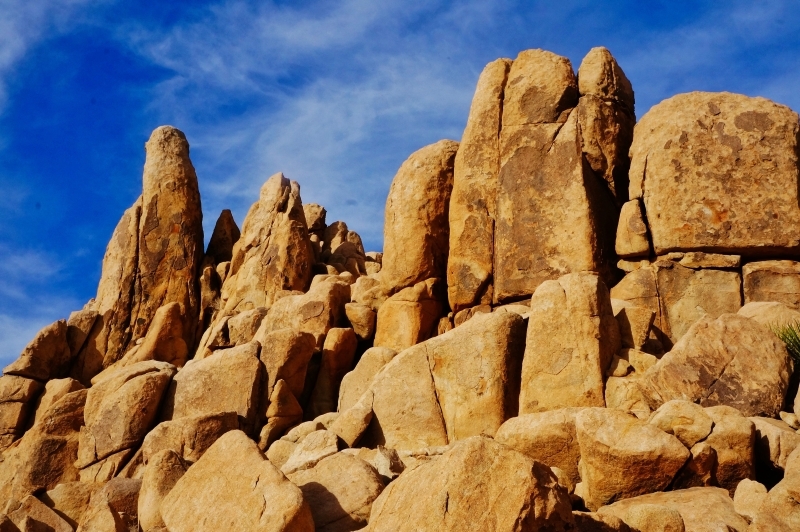 The best time to visit is late afternoon when the low sun angle lights the huge granite boulders and the contrasting colors of plants, rocks and sky really start to pop out. 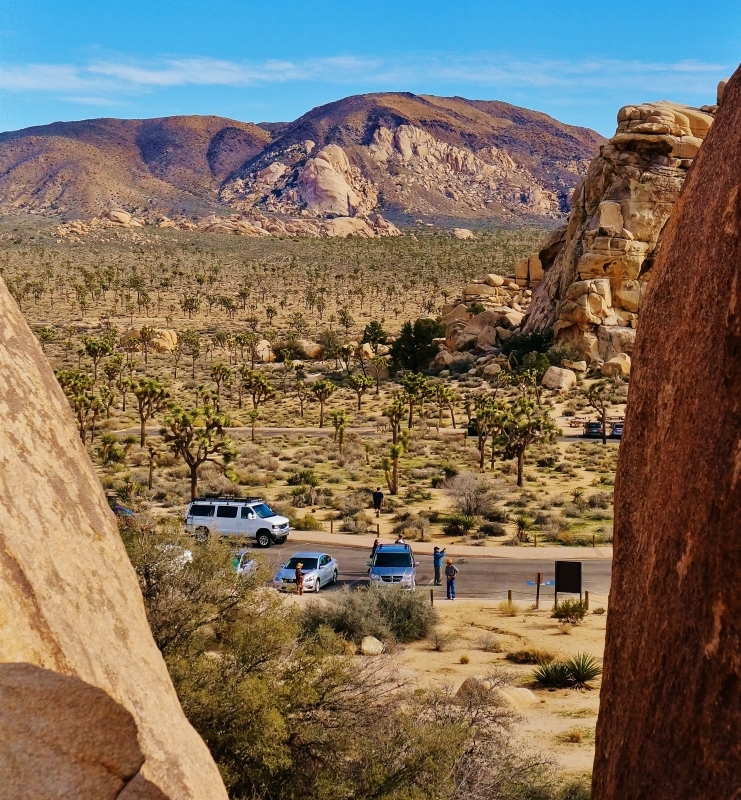 Well, enough words about Joshua Tree National Park. 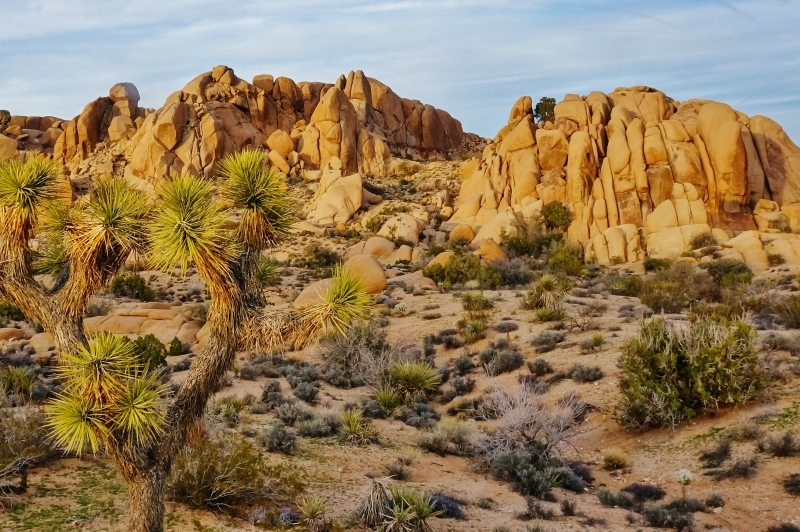 Please enjoy a slice of it through the following video and stills. 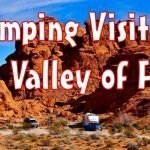 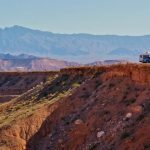 I think they’ll show you why it’s very high up on my list of beautiful places visited in our RV.